Quick detach mounting assembly for wood stock. These were taken off cracked wooden buttstocks. Includes everything pictured which is the mounting plate with spring loaded release lever. Screws are not included but those can be easily replaced by the home gunsmith. This is a great product for those making customs stocks for the Uzi. 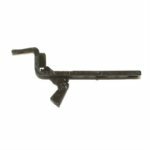 The QD system from the wooden stocks is a great option for any custom stock. "Uzi QD Mount for wood stock"
Product Review: Excellent Part , Absolute Perfect fit for (Victor Poly-Stock) Many Thanks !